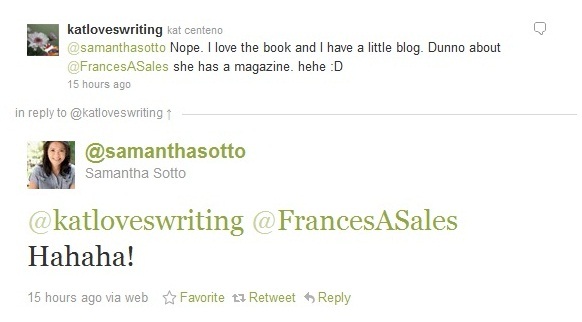 I first heard of Samantha Sotto from Chuvaness. Her story is inspiring. 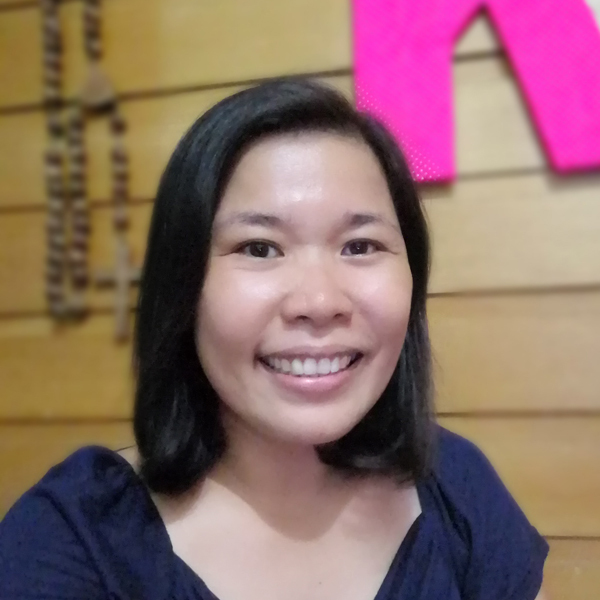 She is a mom who had three hours to spare while waiting for her son’s dismissal from school. In those three hours, she kept herself busy by writing a book. In the coffee shop, she conjured up stories with her vivid imagination by drawing inspiration from her travels. Her path to becoming a published writer sounded like a story of another favorite author. Thus, it further piqued my interest but because I live in city with no decent bookstore, buying the book was not in my to-do list for the moment. That was July 25, 2011. As I write this post, it is August 8, 2011 and I finished reading the book yesterday. I never thought I’d get my copy this soon. The book was released in August 2, 2011. 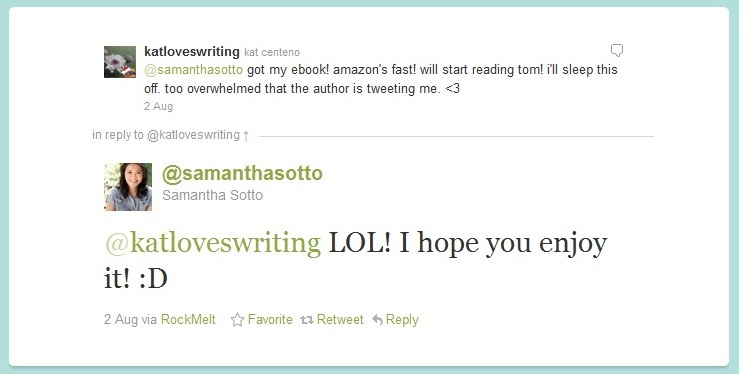 When I started following Samantha Sotto on Twitter, I learned that there is a kindle version of the book. I did not think twice in downloading it. I got Amazon credits and I am amazed how easy it is to download. I do not have the Kindle device but there is a “Kindle for PC” application from Amazon that can be downloaded for free. Like what I have experienced before, Twitter helps me connect with people, including authors I am interested in. When Samantha’s tweets showed up in my timeline before, I just read them like any other tweet- read and move to the next. It did not catch my fancy until Melissa Senate’s name was mentioned. That name sounds familiar. I think I have read her book before. A quick Google search told me that I did read her ‘See Jane Date’ book which was made into a TV movie starring Holly Marie Combs. I made a quick tweet about it and I got replies!! Melissa Senate replied, too! This is just awesome! Oh, Melissa has other books written after “See Jane Date”. I must get copies of them. It was this tweet that got me to thinking that if it is on Amazon.com, there might be a Kindle version of this book. I need not wait before I’m in Manila in September! 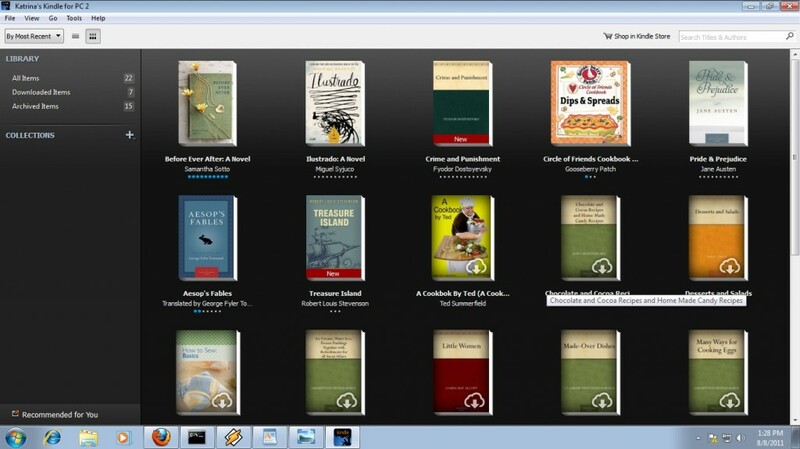 I have installed the Kindle-for-PC application and downloaded some free books from Amazon before. 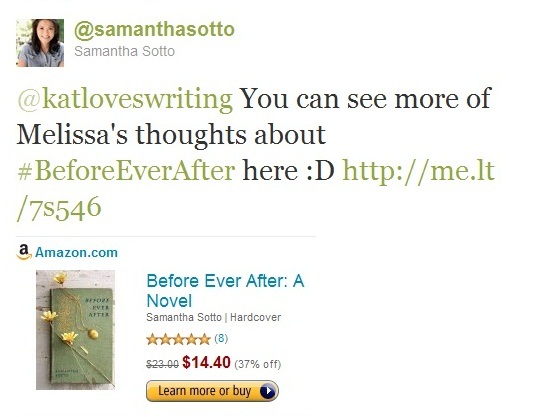 And I still have Amazon credits so I quickly bought the kindle version of “Before Ever After”. I am amazed how quick the process was. With a few clicks and less than 10 seconds later, the book is already in my Kindle application. Samantha was gracious with her replies. What a nice person! Oh, I am sooo getting my post-it signed! 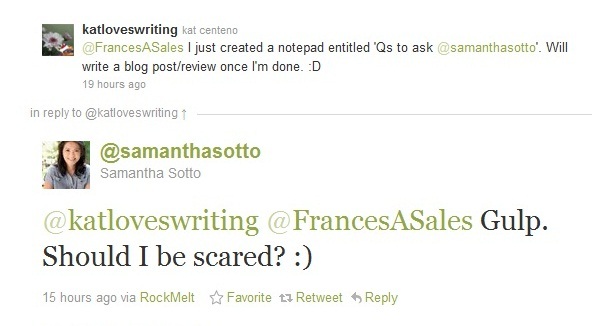 There’s nothing to be scared of, Ms. Sotto. Too bad I did not know that she had a blog before she became this big. I would have loved to be part of her campers. She had a blog which chronicled her journey to becoming an internationally-published writer. It also showed snippets of her writing process. That said, it is never too late to become a camper. Her website is up and she updates her blog. When I have the time, I will retrace her steps in this wonderful writing journey. Baked eggs played an important part of the story. You can read the first 30 pages of the book. When she shared the excerpt, I already finished reading the book. I thought it was the excerpt for her 2nd book! Haha Fan-girl mode! I posted my review on Amazon. Read the other reviews here. Since I tweeted Samantha that I created a document for all my questions, I feel compelled to create a substantial review with coherent sentences which explore the book a lot more than what I have written on Amazon. I can’t. Words escape me. So just allow me to just post the contents of that document. 1. How do you know all these places? That graveyard in France was not a regular tourist destination. -Then, I found your old blog. You’ve been traveling a lot. 2.. Wow. Red roses =‘I love you.’ Pink carnations say ‘I’ll never forget you.’ And purple hyacinths, well, they say ‘please forgive me.’ How do think of these things? Nice touch on the the crumpled purple hyacinths. 3. Thank you for including the Philippines in your book! 4. I like the line: “Guilt left a fishy aftertaste.” Never heard nor read that line anywhere. 5. Where did you research all this “historical” stuff? Samantha, are you some kind of the history buff? You have an encyclopaedic knowledge. Historical is in quotation marks because I am too lazy to verify the itty-bitty details of the stories if they had parallel accounts in world history. If this was a real book (tangible, i mean, as opposed to a kindle version), I would have finished the book in one sitting. I bought a kindle version because I wanted to read the book immediately. However, I do not own a kindle, laptop or any portable devices that will allow me to read the book while lying on the bed- the most comfiest position for reading. I own a desktop and had to sit upright staring at the computer screen. Add to that the distractions of twitter, facebook and tv shows. (I just start watching ‘Game of Thrones’ and it is a very engaging series. ) As much I would like to finish the book, my eyes can’t. It is good that the book is composed of different mini-stories meld together by a group tour which is a flashback. It is a series of flashbacks within a flashback. The mini-stories intricately woven to complete a puzzle. The book cover reflects such theme. It is a book cover in a book cover! Photo credit: Not mine. This is a screencapture of the book cover on the Kindle application. It is amazing how she conjured up all these stories. She has a way with words.They sound to like lullabies that sweetly lulls me to dreamland. Back to Q1: I checked your new site. I now understand your vast knowledge on Europe. Haha! I am such a lazy blogger. That is something I should think about. Hmmm. ..who would I like to play Max and Shelley in a movie? This deserves another blog post. You may get yourself an awesome Kindle!